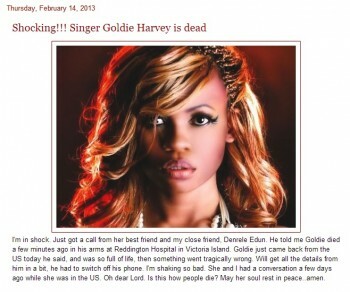 Popular Nigerian Singer, Goldie Harvey, Reported Dead! It came to us as a shock that the popular Nigerian Singer, Goldie Harvey has been reported dead. According to the popular blogger, Linda Ikeji’s website, she got a call from her best friend and Denrele Edun confirmed her passing, saying he died in her arms. We don't know if this is really confirmed, but celebrities like Eva Alordiah, M.I Abaga and Don Jazzy also tweeted about Goldie's death. We also don't know if it was her manager, but a tweet was sent from Goldie's twitter account, and it reads thus - "It is with heavy heart that I have to inform you all that Goldie passed this night shortly after arriving Lagos from LA. May her soul rest in the eternal peace of the Lord." We don't know how true this is. but if it really is true, this is a very sad day for all of us, and we pray that her soul will rest in perfect peace. Life is really short, and we should all appreciate every moment we spend on earth because we don't know how long we have left. R.I.P Goldie.